We have available stock of more than 600 coloured yarns to help to create bespoke sew on labels for your textile products. 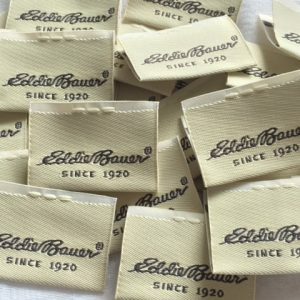 With our professional labelling service and an available, wider range of vibrant colours option, we believe that these bespoke sew on labels and fabric stitch labels will create an outstanding brand identification of your textile products. The yarns we use is an ultimate thin soft yarns, it delivers a delicate woven image. Amazingly is that these are affordable premium bespoke fabric labels. Contact us today to start producing bespoke sew on labels and fabric stitch labels. Our labels design team constantly explores the effects of an increasingly influence of a sense of self (sense of personal identity) as well as the connected local culture and social role that are embodied in the fashionable clothes design. The designs of our custom clothing labels are responding to these evolving new trends in a number of ways, from critical interrogations to surreal or poetic statements. 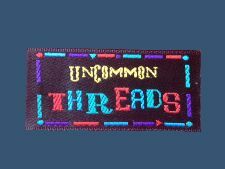 The end result of our woven clothing labels communicates a story, a lifestyle, and a design for self-expression in a simple way. Contact us today, our contact details are here; we will help to produce bespoke brand garment labels for your textile products.